GCA advised AI technology provider Fracta on its sale to Kurita Water Industries Ltd., a global leader in industrial water treatment. Silicon Valley-based Fracta serves the water utility industry with its core software application, which uses artificial intelligence to assess the condition of water mains and predict degradation. The company’s technology-based approach provides utilities with an alternative to simple visual pipe inspections and enables them to quickly and accurately make better pipe rehabilitation and replacement decisions. Based in Tokyo, Kurita is a leader in industrial water treatment. The company manufactures water treatment chemicals and equipment, maintains and operates water treatment facilities and provides water quality and environmental analyses. The combination of Kurita’s water treatment technologies and expertise and Fracta’s cutting-edge AI technologies will enable the companies to enhance their offerings and extend their leadership in the US’s municipal and investor-owned water utility industry. 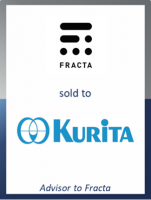 Michiya Kadota, President of Kurita Water Industries Ltd., said: "We are delighted and very excited to be given this opportunity to invest in Fracta Inc. Through the investment, we would like to help the company grow and contribute to improving its corporate value. We believe that we will be able to operate a digital business that will create unprecedented, 'unique value,' by combining Fracta's technologies with our unique products and services and thereby creating a synergy with the company."